Oiralinde: Can you tell me how to get, how to get to Decimal Street? Can you tell me how to get, how to get to Decimal Street? Sebastian loves the Decimal Street I made him. I have been working on place value with Sebastian. Last week we were working on the tens and units houses, and he was very excited to begin working on the hundreds castle this week. 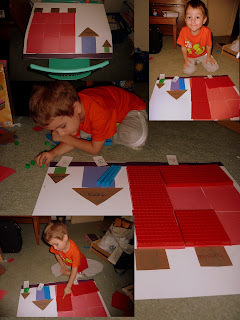 I am using the Math-U-See Primer with Sebastian. He was bored with the lessons up until he hit the Decimal Street (lesson 9). Now he looks forward to the math lessons and loves to play the games with me. He enjoys being able to read large numbers and gets a kick out of my Yogscast-Aww-Surprise-Sound. The dog was also getting a kick out of it (or I was hurting his ears). We are doing very well with school. We finally hit the full swing of the school year and we have fallen into a schedule and a rhythm. Sebastian now loves math as well as science. For the past month we have been reading tons of dinosaur books, doing dinosaur crafts. We are almost done learning the alphabet sounds, and then we will be moving on to sounds blends and reading once we finish the sounds. We'll start learning to read after Columbus Day!! Bible study is going well too. Most of the time we read stories and watch Veggie Tales videos and then do a couple crafts. We made a few different versions of Joseph's multi-colored robe, and we made a talents journal to go with Joseph's story. We are now reading about the Creation. Sebastian has decided the dinosaurs went extinct because God didn't want T-rex to eat us or Apatosaurus to step on us. He brings everything back to dinosaurs. Or transformers.